After a car accident, there are numerous questions and concerns that a victim will likely be immediately confronted with. While vehicular damage and insurance coverage are surely important matters, the most immediate and important concern should always be one’s health. Even when no major injuries are immediately recognized, physical damage from the accident may surface hours or days later. Such is often the case with whiplash. If you are suffering from whiplash due to a recent car crash, take a moment to understand this condition and its effects. Moreover, if your accident was caused by another person’s negligence, don’t let financial concerns get in the way of proper treatment. By consulting a personal injury lawyer, such as Edward Deason who serves the Torrance area, you can seek full compensation for the accident and its injuries. Whiplash is the colloquial term for any neck injury caused by a sudden and powerful jerking movement of the head. In most car accidents, the neck muscles tense up immediately in an effort to protect the body, while the head is forced forward. This over-extension of the soft tissues can cause damage to muscles, nerves, discs, ligaments, and nearby joints. The resulting pain can last anywhere from days to years, depending on the area of whiplash and its severity. Although whiplash may often be associated with more dangerous crashes, even a low-speed accident can result in neck damage. This is particularly true when a driver or passenger tenses up or pushes the head back to brace for an accident. 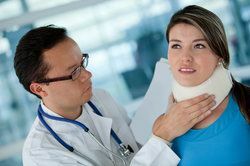 If you are experiencing neck problems soon after a car accident, it is a good idea to visit your doctor, even if the symptoms are mild at first. By examining the area, possibly through the aid of an MRI or CT scan, your doctor can diagnose the severity and type of damage. Unfortunately, there is no single recommended treatment for whiplash. Most options include ways of dealing with the pain or aiding one’s recovery. Over-the-counter medication is often used to minimize discomfort, but prescription painkillers may be recommended for more acute pain. Muscle relaxants or anesthetic injections may also be utilized, especially if muscle spasms are present. Ongoing therapy is also a good way to decrease symptoms, including hot and cold compresses, exercises, and ultrasound treatment. Injuries from an accident can result in expenses that are both steep and long-term, but you should not have to pay for any damages that are deemed to be someone else’s fault. Furthermore, it can be difficult to determine how long whiplash will last and the treatment you will seek for it. With an experienced car accident lawyer to fight on your behalf, you can ensure that your damages, medical or otherwise, are compensated to the fullest extent. This can include visits to the doctor, medications, physical therapy sessions, and any wages lost as a result of missed work. It is a good idea to contact an attorney whenever you are seeking compensation for an accident, but it is especially wise to contact one as soon as possible to begin building evidence for your case. For more information on how our legal office can help free you of the financial burdens of an auto accident, contact us to inquire further or schedule a meeting.